Naomi Watts. Jack Black. Adrien Brody. Thomas Kretschmann. Colin Hanks. Andy Serkis. Evan Dexter Parke. Action/Adventure. Drama. Romance. Thriller. 1930s. Hearing Impaired (DVD). Jungle. Aviation. 01 Nigel's Choice. Creature Features. Disaster. Fantasy. Historical. Recommended. A movie in which a lovelorn supersize gorilla and lonely human belle make heavy eyes at each other, not Lord of the Rings here, but Beauty and the Beast! 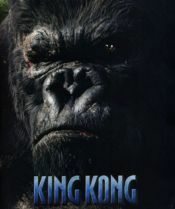 The film is in three chapters; a movie producer sets sail with cast and crew for the legendary Skull Island; where they are attacked by human sacrificing natives, ravenous dinosaurs, cockroaches as big as beer barrels and scorpions the size of cars, to name but a few; what's left of our less than heroic crew return to New York with the greatest prize of all.....King Kong, a monster who outacts the human cast. Peter Jackson's remake is, after the first hour, a non-stop action packed CGI extravaganza that will keep you riveted to the screen.